August was a month that had felt like it was never going to come around. When I first started working in The Chamber of Commerce, Sarah Medcraf CEO, had given me dates to put in my calendar for August regarding the tying of loose ends for our Annual Awards Dinner. It’s surprising how quickly these far in the future dates become ‘tomorrow’ when you work in an environment with so many avenues open at once. So when the 1st August came around and my calendar alerted me to contact the piper for the dinner with the final arrangements, I moved to the edge of my seat, took a deep breath, and knew that the next two weeks were probably some of the most vital in The Chamber’s annual agenda. For a while this felt daunting and a little consuming. Moray’s biggest black tie event was almost here and all the hard work of Sarah, Lara and I was going to go on display in front of everyone. Then I remembered what Lara and Sarah had told me when I first started working here – “Everyone wants you to succeed, no one’s waiting for you to fail”. I didn’t need to be daunted; I needed to be comfortable and confident in my abilities. I didn’t need to be consumed; we’d done a great job of organising everything, and the other elements of our job still needed our support and attention. I’d assumed that this month’s blog would be similar to the press releases that we’ve written about the dinner, celebrating all that was achieved and the outcomes that Moray has achieved. But in reflection, organising and being part of something of this scale is acknowledging the journey you went on to get there in the first place. I’ve recently returned from 2 weeks holiday where I caught up with many friends and family down south who always ask me how my new job is going. The thing that I tell everyone is “it’s so refreshing to work in an environment where people want you to do well, and make you feel good about the work that you do”. This quality in a workplace is rare and shouldn’t be over looked. Collaborative and supportive working brings out the best in everyone involved, and the Annual Awards Dinner was a massive extension of this. It began with the fantastic foundations laid by Sarah Medcraf and her predecessors of an event that had a reputation that proceeded itself. It prospered in the generosity of the community, the donations, the support and the good will shown by so many of our members and partners. It ended with long hours and hard work from all of those involved, so that we could show Moray how proud we are of it, and how grateful we are for the continued support that allows us to the jobs that we do. Delivering events like this always results in a certain degree of critical analysis, and to this I’m no stranger. We requested feedback from those who attended and every word given to us is appreciated. Amongst many successes there are things that we can improve on, and we hope to make next year even bigger and better than the last. 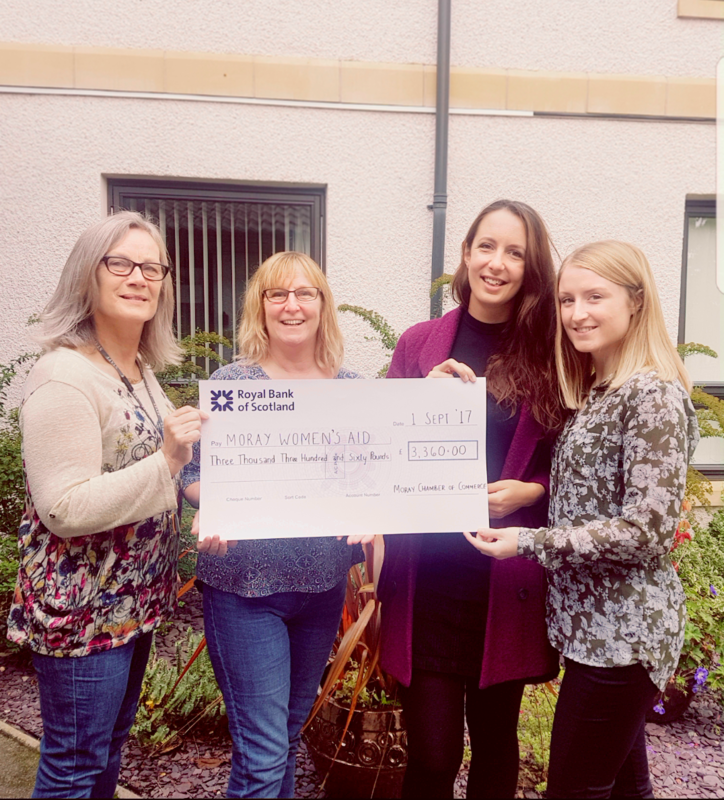 We raised a fantastic amount of money for Moray Women’s Aid who has consequently made some new connections that will help their future journey. We gave Roger Cruikshank a new platform to share his message upon, to raise awareness of mental health, and especially in and amongst our very successful work places. We gave a group of young people from Lossie Entertainment Academy the opportunity to perform in front of a huge influential audience. The college, their staff, and their students all got to experience hosting such a big event, and all of this should be celebrated. Here at The Chamber we are grateful for all of it, and don’t take any of it for granted. So thank you. Thank you for attending our events, thank you for bidding in our auction, thank you for popping by our offices to say hello, thank you for reading this blog. By doing any and all of these things you allow us to do a job which we love, and make a difference to the business community in Moray.